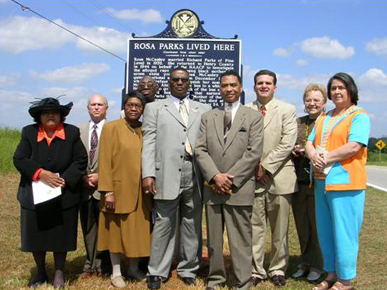 In April 2006, members of the Historic Chattahoochee Commission and the Henry County Historical Group dedicated a historical marker honoring civil rights activist Rosa Parks. From left: Dorothy Baker, Larry Smith, Emma Cotton, A. B. Cotton, Ernest Sampson, Rep. Locy Baker, Derek Peterson, Roberta Childs, and Rosalyn Trammell.